Some believe that business and enterprise architecture do not have a place in digital transformation, citing misconceptions such as that the business and technology environment is changing too quickly for architecture to play a role, or that architecture slows down the process of transformation. However, when successfully deployed and business value-focused, an architecture practice is a critical enabler—in fact a necessity—for digital transformation. Business architecture (along with IT architecture) provides the foundation for digital transformation from two key perspectives. First, it represents an organization and its ecosystem at a high level from end-to-end including views of capabilities, value streams, information, and organizational structure as well as the relationships among these business views to strategies, products, policies, initiatives, and stakeholders. 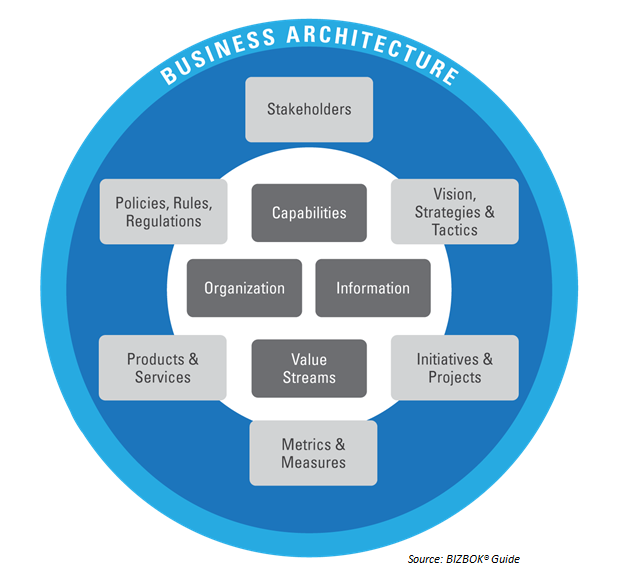 Business architecture also connects to all other aspects of the organization, including the operating model level of detail inclusive of people, process and technology. Together these views essentially provide the fundamental structure for digital transformation so that people can understand what the organization currently does from a business perspective (without having to rediscover it) and then methodically assess and redesign how it will change as a result of the digital transformation. This could mean digitalizing existing capabilities and be offering them through different channels or completely reinventing the organization’s business model. Figure 1 shows the business ecosystem represented by business architecture. The second way in which business architecture provides a foundation for digital transformation is through its role in translating strategy into a coordinated set of actions for execution. With a documented enterprise level business architecture (and IT architecture) in place, the business and IT impacts of the digital strategy and desired customer experience can be cataloged and assessed and then collectively architected across products and business units. The resulting target architecture(s) can then be scoped into a set of transformation initiatives in the most effective way across business units—without redundancy, conflicts or dependency issues. The traceability from strategy and objectives through the business architecture down to initiatives also allows for measurement to ensure the initiatives actually deliver on the expected results. This top-down, cross-business unit approach to strategy execution is essential to any type of business transformation—and to an organization’s ability to continually adapt to change. While it requires more than just business and IT architecture to achieve, an established architecture practice will help to drive much of this approach within the context of a transformation. 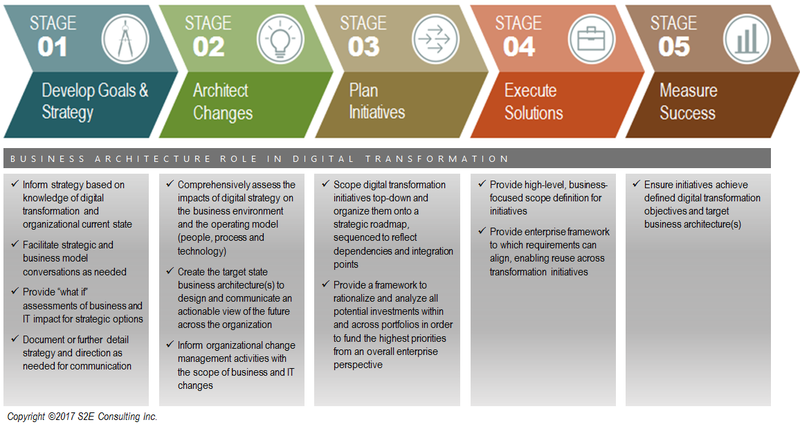 Figure 2 summarizes the role business architecture plays across the strategy execution life cycle within a digital transformation context. Many organizations struggle with how to get started and organize for a digital transformation. The sheer amount of change needed can be overwhelming and it necessitates a different way of working, typically requiring a high degree of cross-business unit collaboration in order to achieve the integration and transparency necessary to shift towards customer centricity. However, an organization that has an established architecture practice can greatly accelerate and improve the results of their digital transformation both because of the enterprise framework and cohesive strategy execution approach that are inherent to architecture. Leveraging the expertise of business and IT architects will not only result in more successful digital transformations but will also build the organizational capacity necessary to adapt to continuous change in the future as well.